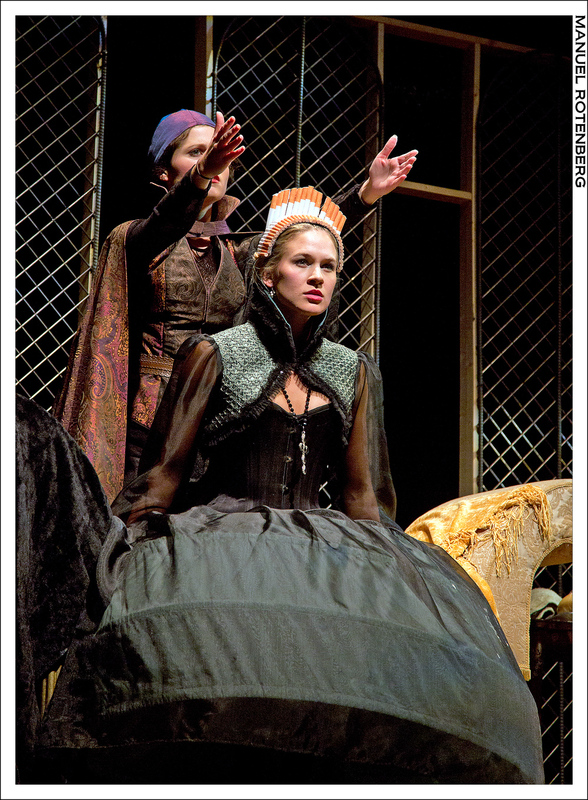 Pata Sola (Hannah Corrigan) dresses Regan Linton as Queen Elizabeth. Elizabeth (Regan Linton) and her adviser Burghley (Danvir Singh) are greeted by the Spanish Ambassador (Tom Patterson). King Philip of Spain (Michael Hammond) plots to defeat Elizabeth. Nostradamus (Hannah Corrigan) shows Queen Catherine of France (Sarah Halford) visions of Mary Queen of Scots. Elizabeth (Regan Linton) watches as God (Matt MacNelly) conducts the Earth (Christian Huerta-Murillo) and Moon (Lindsay Shield). 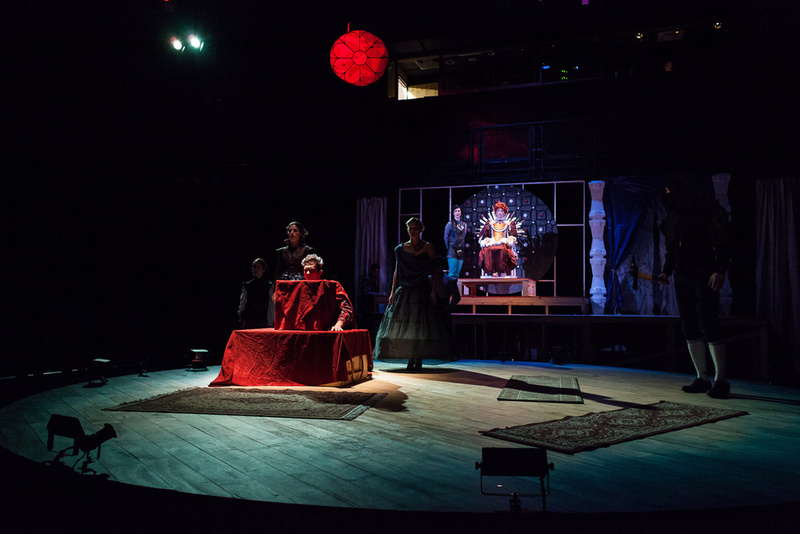 Elizabeth (Regan Linton) asks her advisor/lover Leicester (Michael Hammond) whether she should kill Mary Queen of Scots. Elizabeth (Regan Linton) watches as Mary Queen of Scots gets executed. Tilly Boom (Sarah Halford) accompanied by Matt MacNelly and Andy Muelhausen. Elizabeth(Regan Linton) and her advisers (Vi Flaten, Danvir Singh, Hannah Tamminen, Brian Smolin, Michael Hammond) plan how to get money for war. The laundress Tilly Boom (Sarah Halford) arouses Archibishop Whitgift (Brian Smolin) and Elizabeth (Regan Linton) by dressing them in their symbols of power. 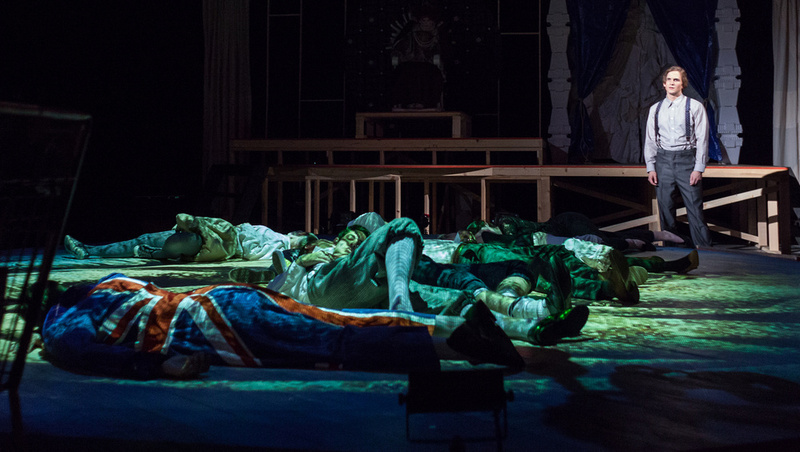 Shill (Tom Patterson) looks over bodies washed up from the Spanish Armada. 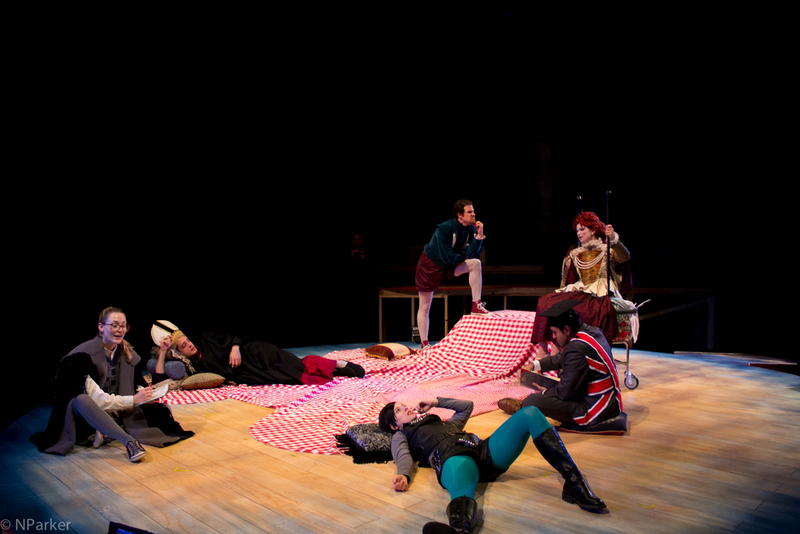 A Spanish priest (Vi Flaten) spoon-feeds King Philip (Michael Hammond) lies after the defeat of the Spanish Armada. 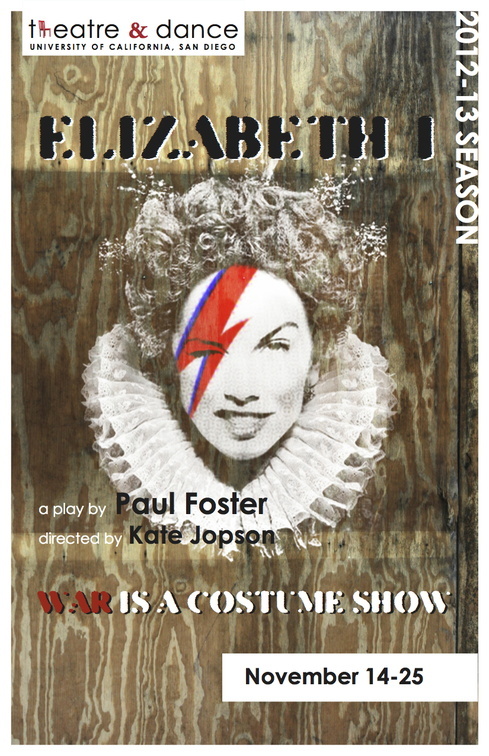 When I read Paul Foster's script, I was moved by the words that Queen Elizabeth speaks just as the Spanish Armada is about to hit the shores of England, “Our posturing, pomping, mumming, universe-shaking works are not important at all. We were merely spooning the pabulum of dreams.” She and her people are facing death, and she suddenly learns that the earth is not the center of the universe, that our problems are just the problems of a single speck circling a greater star. In this thought, she finds comfort. With my production I sought to make all the glamor and materialism of our current time feel little in comparison with the larger struggles that have occurred throughout human history. Pieces of costumes and sets were made from various recycled materials like cigarettes, ice-chests, bottle caps, tarps, shopping carts, and apple insignias: the refuse of our age. Mirroring how theater has lost it's cultural value today, the actors struggled to finish the play as the theater they were performing in was being torn down around them.